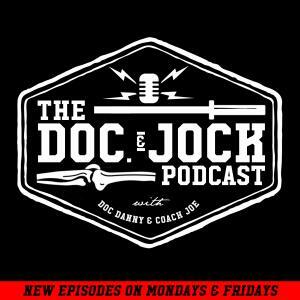 On Episode 182 of the Doc and Jock Podcast we catch-up with Jason Fernandez to talk about how to start a successful barbell club in your CrossFit gym. Jason's gym, CrossFit Rife, features one of the America's best Barbell Club which is called the Barbell Syndicate. The club is massively successful and is ran by our friend Phil Sabatini. On this episode Jason shares some tips of how to start and run a successful barbell club. Jason Fernandez is a co-owner and head coach at CrossFit Rife. Prior to founding CrossFit Rife, Coach Jason was a three-sport athlete. Growing up, he played primarily basketball, baseball, and football – also having dabbled in cross country, track & field, and rugby. While studying at the United States Naval Academy, he played Div I basketball and served as the team captain during his senior season. Jason is also a member of the CrossFit HQ Level 1 Training Team.